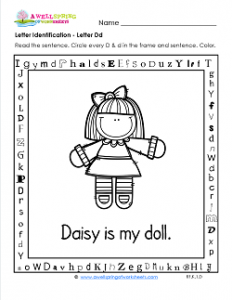 “Daisy is my doll.” is the sentence on this letter identification worksheet. I should have written, “Daisy is my darling doll.” because she is darling and because I could have tucked one more d in the sentence. Anyway, have your kids look carefully for all the d’s on this worksheet. There are 12 in the frame, three on each side, both upper and lowercase. There are two in the sentence, for a total of 14 on the page. Have your kids look for the hidden sight word “see”, too. If they get stuck, it’s in the top part of the frame.